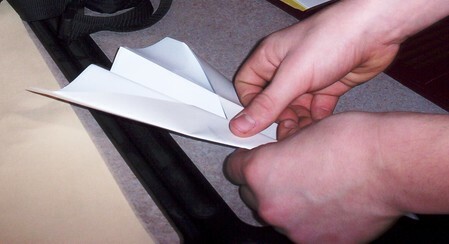 Every person has found fun in making paper airplanes as a kid. There is something very intriguing about the ability to fly. There is something fun about being able to model a plane and watch it sail with a single sheet or ordinary paper. This is a great way to explore the dynamics of flight. You don’t need a license to learn how to fly this kind of airplane. All you need is some ordinary paper and curiosity. 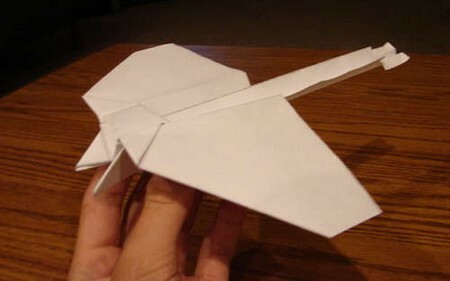 Here is how you can make a paper airplane. Read on for more instructions. Use a plain sheet of paper. A standard sized piece of writing or printing paper is ok to use for this project. Put the plain paper on a flat surface. Fold the plain paper with the edge pulled close towards you. Now fold and crease the paper in half vertically. Aligned the edges up and use the index finger and thumb to crease the paper. This is making the body of the plane. Grasp the left corner of the paper and fold the corner down to the crease you just made. The angle is on the diagonal. Align the edges. When they are, make another crease the same way as before. You should have formed a triangle. Flip the folded paper over on the other side. Grasp the right corner of the paper and fold it on a diagonal in a downward motion. You want to also align the edges. Crease this. Use the edge of the right side of the paper and fold it down to the very first crease of your plane. Crease. Flip the paper again. Fold the edges to form a triangle that measures 90 degrees. Make wings for you plane. Flare the wings of your paper plane all the way out. Measure 5 inches from where the front tip of the plane is and use the scissors to cut a ½ inch slit into the bottom of the airplane. Then, put another cut ½ inch behind the first cut. Fold the flap up. Grasp your paper airplane firmly near the flap you created underneath. Launch the airplane into the air with a quick motion of the wrist. Play around with the weight and also size of airplanes. Don’t be afraid to experiment. Move the tab of the plane around to see what effect it has. Your creases should be very sharp. This makes for good flight mechanics.